Winter is a season when many individuals experience health issues that can make everyday life rough. Whether it is a cold, flu, or a skiing injury, many people will find their overall health compromised at some point during winter. Thankfully, chiropractic care can help keep you healthy during winter. Paying a visit to your chiropractor during the cold season can help reduce, if not prevent, health problems as well as keep you feeling your best. If you are thinking of skipping that chiropractor visit, these reasons should convince you to undergo chiropractic care. When people think of winter health problems, cold and flu are the first two things that come out of their minds. The months of December, January and February can trigger a rise in bacteria and viruses in human populations. Fortunately, you can strengthen the immune system of your body by undergoing chiropractic care. This form of care allows you to fight off cold and flu by fortifying your immune system. Moreover, it improves the communication between the brain and the rest of the body and fixes the alignment to the vertebrae. Besides cold and flu, another frequent problem during winter is depression. SAD, which stands for Seasonal Affective Disorder, is a condition where people experience symptoms of standard depression during the winter months. Chiropractic care can help individuals with SAD by stimulating their central nervous system and regulating their hormone production. Winter can make people’s muscles stiff. Apart from becoming inflexible, you may find it difficult to stretch your muscles. Instead of expanding, your muscles contract to keep you warm. When you visit your chiropractor, he or she will help keep the stiffness away by ensuring that your spine stays properly aligned. If you have arthritis, know that winter weather can bring additional pain to your joints. Experiencing pain can lead to more discomfort and a decrease in mobility. With a few gentle spinal adjustments, however, you can move your joints without much discomfort and stiffness and alleviate additional inflammation due to the cold weather. Apart from minimizing joint pain, chiropractic care reduces back, and neck pain caused by factors like joint restriction, joint dysfunction, and muscle imbalances. Your chiropractor will help preserve the flexibility of your spinal joints to help you move freely. Beginners who ski and play other winter sports can develop musculoskeletal injuries. If you injure yourself after playing a winter sport, seek help from a chiropractor. Rebuilding your coordination and strength with proper chiropractic care is possible. 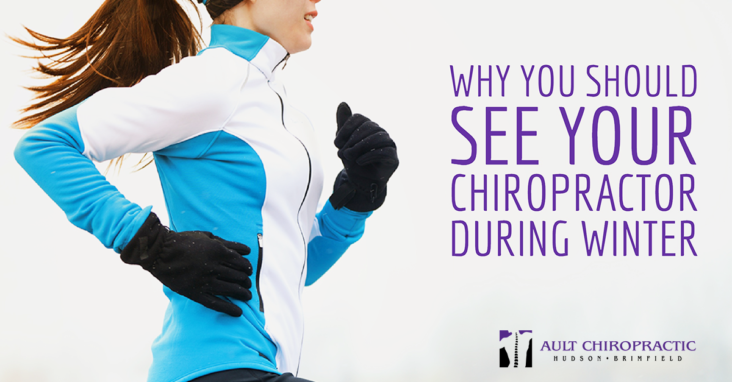 Additionally, your chiropractor will help you recover faster to allow you to resume your activities throughout the winter. If you are looking for an experienced chiropractor during the winter season, don’t hesitate to go to Ault Chiropractic of Hudson and Brimfield. The chiropractic care we provide utilizes state-of-the-art chiropractic techniques. Moreover, our chiropractors, Drs. Robert and Rebecca Ault, have extensive experience and training in spinal adjustment. They will help you reach your wellness goals.